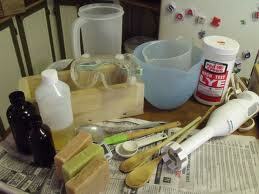 Soap making is not recommended for children as lye can pose potential hazards. Lye can cause significant burning, is fatal if swallowed and gives off noxious gas and can greatly irritate the lungs when combined with water. Work in well ventilated area. Always have a bottle of vinegar handy to neutralize the lye/water if it happens to splash on your skin. Be careful not to inhale the fumes and continue stirring until the lye is dissolved in the water and the lye/water mixture is clear.